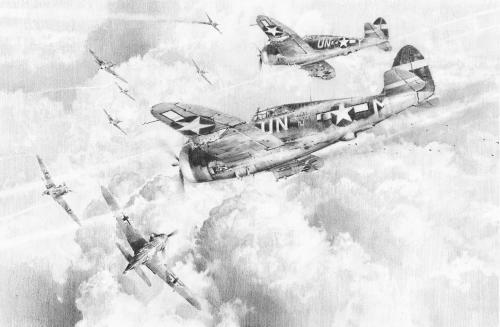 Robert Taylor's masterful portrayal of 'The Wolfpack' evokes the menacing, raw power of the 56th Fighter Group's P-47 Thunderbolts as they climb through majestic cloud formations stretching as far as the eye can see. With 'Bud' Mahurin in the lead aircraft and 'Bunny' Comstock off his tail, they are already high above the east coast of England, in moments they will link up with the B-24's to begin the perilous journey deep into Germany. Adding great credence to this exceptional new limited edition, each print has been signed by some of the most distinguished veterans of Zemke's famous 'Wolfpack'. This NINE signature edition is additionally issued with Robert Taylor's pilot signed companion print 'A Pack of Wolves'. 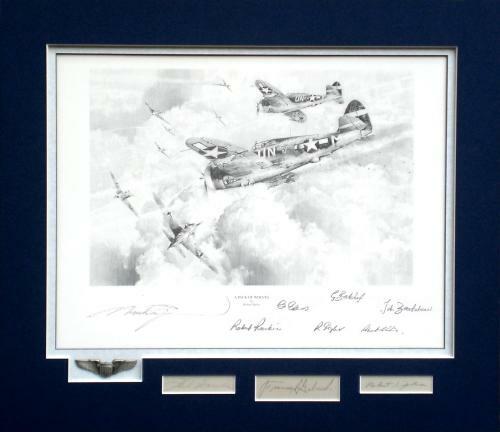 These specially released TWELVE signature A/Proofs are additionally signed by further 56th F.G. pilots, including Bunny Comstock, pilot of the second aircraft in Robert's painting. 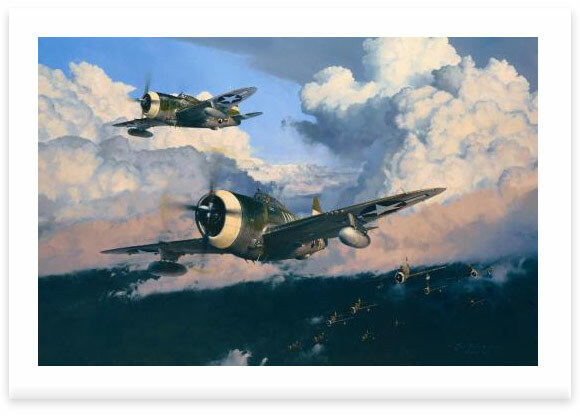 Released with all the components of the Artist Proofs, as a superb extra bonus, the Wolfpack Tribute Proofs are published with the companion print 'A PACK OF WOLVES' matted to museum quality to include the signatures of the three most famous Aces associated with the 56th Fighter Group. This edition has a total of SEVENTEEN signatures. Overall Print Size: 34.3/4'' wide x 26.1/2'' high - Companion Print Size: 20.1/2'' wide x 16.1/2'' high. Approximate matte size: 24.1/2'' wide x 22'' high.